Expressing apprehensions on their children's safety after a school bus was attacked by a group of men protesting against the release of the film 'Padmaavat' in Haryana's Gurugram, Parents in Delhi called it an administration failure. "As of now it's peaceful here but it is indeed disturbing that in Gurugram some schools are shut as preemptive measures due to protests. It is a failure of the administration," said one concerned parent who had come to drop his kid at school. Lalit, another parent said the situation is panicky which is why he had come to drop off his children at school himself. "There is panic everywhere. If school bus can be attacked in Gurugram then it can happen in Delhi as well. Even here there are cinema halls near schools, so I have come to drop my child to school myself," a parent told ANI. The situation became tensed in Haryana's Gurugram as protestors threw stones at the bus, which was carrying students, teachers and staff of GD Goenka World School. "As soon as we came out of the school the bus was attacked. Even the police could not control them. The children somehow took cover inside the bus," said a school staff. 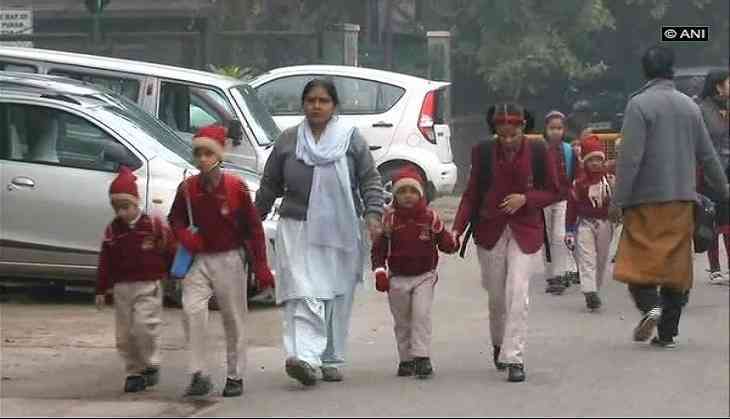 Meanwhile, schools in Guruguram, including Pathways school, GD Goenka School, Shiv Nadar School and Delhi Public School, will remain closed till Sunday after yesterday's attack on a school bus. The attack was condemned by both Congress and Bharatiya Janata Party (BJP). "Currently, 13 people have been detained (in this connection) and action will be taken," confirmed Sandeep Khirwar, Commissioner of Police. Meanwhile, Section 144 has been imposed in Gurugram, which will be in effect until January 28. In some states, including Uttar Pradesh, Telangana, Gujarat, Maharashtra and Haryana, the members of Karni Sena and other fringe outfits have resorted to burning posters and vandalizing the ticket counter of the movie theaters. Security forces have been deployed at various multiplexes in Dehradun ahead of 'Padmaavat's release. Meanwhile, unknown miscreants have set a mini truck at Narsingpur village of Gurugram. 'Padmaavat' has released nationwide today.